Home / reviews / Mihuru.com review: book flight ticket now, pay later! 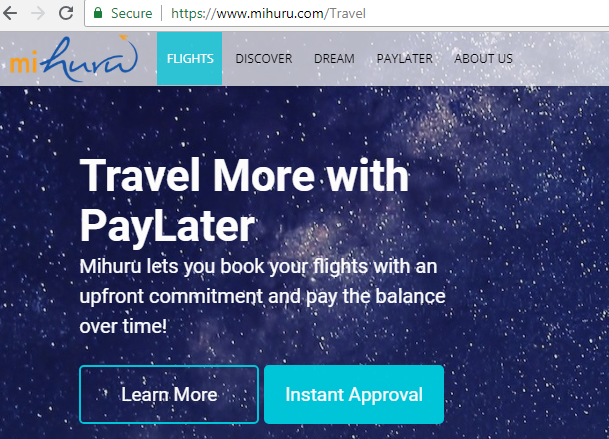 Mihuru.com review: book flight ticket now, pay later! I saw Mihuru's ad on facebook and spent some time understanding their model. Mihuru allows you to book your flight ticket by paying only a portion of the amount and pay the balance before travel date. This is useful if you don't have all the cash upfront but don't want to pay interest on loan. What is the savings advertised by Mihuru? How can I save with Mihuru? If you had the entire amount, you can pay now and book.. But what if you don't have 15000 right now. If you wait for 2 weeks till you have 15000, ticket price might have gone up to 18000. That is 3000 extra. Now you've to may 3000 more. With Mihuru, you can book when it was at 15000, by paying only say 5000 or 6000 + a one time service charge and pay the balance within next 1 month. Thus you don't have to pay the extra 3000 just because you didn't have enough cash. Assume you've paid a service charge of 300 for Mihuru, you still save a net 2700. Note that this is hypothetical- while ticket prices generally increase closer to travel date, the % of variation depends on lots of factors- sometimes savings will be more, sometimes less or none. You've to take that gamble. If you feel price will definitely increase, you desperately want to travel but don't have enough cash right now (but sure of being able to pay within next few weeks) then you can try Mihuru and hope to save. What if I have a credit card? Credit card gets you upto 45 days depending on your date of transaction n billing cycle to pay. So for near term bookings credit card holders may not need Mihuru. But what if you're booking 4-6 months in advance? In such cases even credit card holders can try Mihuru if they can't pay entire amount within 45 days. What happens if I book but don't pay the balance? Mihuru service can be availed only if your travel date is minimum 30 days away. Can't be used for immediate travel. This is obvious as there has to be some time for you to pay the balance. Note that any change/cancellation will incur Airline fee + Booking agent fee + Mihuru service charge- this will be an extra expenditure compared to booking directly on airline website. I am not sure if Mihuru can be used to book ultra low fare no-cancel, no-refund tickets- for example, I book AirAsia sale tickets years in advance and face a risk of losing 100% if I can't travel. I don't think I can offload that risk to Mihuru- they will recover entire amount from me if I don't pay the balance. How does Mihuru make money? Mihuru Terms of Service says users will have to pay a one time service charge. The exact amount is not known, but probably a few hundred per ticket. This forms their main source of revenue on each transactions. - May be a small commission from airlines? Mihuru is a Mumbai based startup, who got some USD 150k seed funding recently. I think the idea is great- an untapped market- enabling more people to travel/save while traveling. I wish them all the best. Will be interesting to see how positively traveling public adapt this concept. Even for people with strong bank accounts and credit cards, why would you want to block your limits ? Also, why would pay extra by booking last minute when you can plan 2-3 months in advance and save upto 35% on each flight ticket ? Its a sensible choice to book now and pay later. On the contrary, I would say, this is ideal for Indians. Indians are very close to family and take vacations together. When there are large amounts involved, it is better to plan it out. This planning also saves you 30-35% compared to a last minute booking. Also, this means there's enough money in your account for daily expenses and other monthly commitments. You being a frequent traveler must be planning your trips well in advance so, this would be an ideal concept for you too. Also note that the interest varies depending on the time of EMI plan. Surely, you can spend 5-10% extra when you're saving 30-35% on each ticket.